Connecticut National Guard Detachment 2, Company I, 185th Aviation Regiment of Groton has mobilized and will deploy to the Sinai Peninsula, Egypt, to support the Multinational Force and Observers. The unit left Connecticut Jan. 15 for Fort Benning, Ga., for further training and validation. The unit operates C-23C Sherpa aircraft and has deployed three times in the last seven years in support of the conflicts in Iraq and Afghanistan. The unit will provide an on-demand aviation asset to the Multinational Force and Observers commander to support its mission of supervising the security provisions of the Egypt/ Israel Peace Treaty. The Pentagon is moving U.S. warships and other military assets to make sure it is prepared in case evacuation of U.S. citizens from Egypt becomes necessary, officials said Friday. The Kearsarge, an amphibious assault ship carrying 700 to 800 troops from the 26th Marine Expeditionary Unit, and the Ponce have arrived in the Red Sea, putting them off Egypt’s shores in case the situation worsens. Pentagon officials emphasized that military intervention in Egypt was not being contemplated and that the warships were being moved only for contingency purposes in case evacuations became necessary. In addition to the Marines, the Kearsarge normally carries around four dozen helicopters and harrier jets that would permit evacuations and other humanitarian operations, the officials said. More than 1,000 Marines from the Kearsarge were sent to Afghanistan last month on a temporary deployment, leaving roughly one-third still aboard, officials said. The Kearsarge is an attack vessel. In carrying out her mission, Kearsarge not only transports and lands ashore troops, but also tanks, trucks, artillery, and the complete logistic support needed to supply an assault. The assault support system aboard ship coordinates horizontal and vertical movement of troops, cargo and vehicles. Monorail trains, moving at speeds up to 600 ft/min (3 m/s), transport cargo and supplies from storage and staging areas throughout the ship to a 13,600 square feet (1,260 m2) well deck which opens to the sea through huge gates in the ship’s stern. There, the cargo, troops and vehicles are loaded aboard landing craft for transit to the beach. The air cushion landing craft can “fly” out of the dry well deck, or the well deck can be flooded so conventional landing craft can float out on their way to the beach. 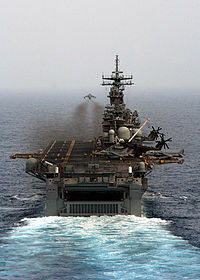 Simultaneously, helicopters are brought from the hangar deck to the flight deck by two deck-edge elevators and loaded with supplies from three massive cargo elevators. Kearsarge’s armament suite includes the NATO RIM-7 Sea Sparrow point defense system for anti-aircraft support, RIM-116 Rolling Airframe Missiles, 25 mm chain guns and the Phalanx close-in weapon system to counter threats from low-flying aircraft and close-in small craft. Missile decoy launchers augment the anti-ship missile defenses. Kearsarge is fully capable of amphibious assault, advance force and special purpose operations, as well as non-combatant evacuation and other humanitarian missions. Since her commissioning, she has performed these missions the world over, including evacuating non-combatants from Freetown, Sierra Leone, on 31 May 1997 and rescuing Air Force Captain Scott O’Grady from Serb-controlled territory in Bosnia on 8 June 1995. Additionally, Kearsarge is fully equipped with state of the art command and control (C&C) systems for flagship command duty, and her medical facilities are second in capability only to the Navy’s hospital ships, USNS Comfort (T-AH-20) and Mercy (T-AH-19). These facilities allowed Kearsarge to serve a dual role during the 1999 NATO bombing of the Federal Republic of Yugoslavia, as a platform for bombing missions against Serb forces in Operation Allied Force, and as a treatment facility for Albanian refugees in Operation Shining Hope. In addition, the aircraft carrier Enterprise is in the eastern Mediterranean. The Pentagon originally announced that the carrier was heading through the Suez Canal for the Arabian Gulf, but the crisis in Egypt appears to have prompted a decision to keep it in the Mediterranean at least temporarily. The Enterprise is the longest naval vessel in the world, and is powered by eight nuclear reactors. The Enterprise does not appear to have any dual role for evacuations, but is simply an offensive aircraft carrier. Therefore, I see no clear indication that the U.S. government has affirmatively decided to directly involve our military in Egypt. However, it is obvious that the government is at least planning for the possibility. A “very senior” member of the US Marine corps is telling people “multiple platoons” are deploying to Egypt, a source tells us. There is a system within the US Marines that alerts the immediate families of high-ranking marines when their marine will soon be deployed to an emergency situation where they will not be able to talk to their spouses or families. That alert just went out, says our source.